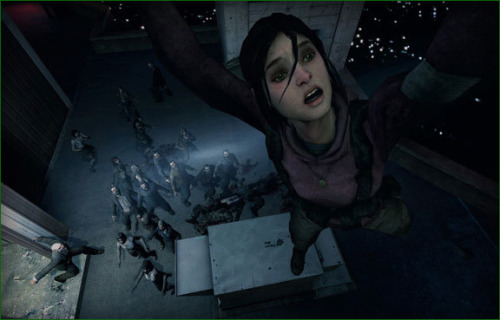 Left 4 Dead... the name says it all, you are really LEFT FOR DEAD! Stranded with a shotgun and pistol to plow through as many zombies on your way to safety. This is an amazing and thrilling game to play by yourself or with friends. It is available on the 360 and PC. This game can get addicting and you can find yourself playing for hours upon hours! The graphics are simply stunning. The blood, guts, and gore are now more realistic than ever, all done on Valve's Source engine. You and your friends (online, lan, or AI) start off in a safe zone. Load up on ammo and explosives then carefully explore your way through the world to the next safe zone without dieing. Beware!! Not only are there your normal zombies running full speed ahead at you, but you will come across other "elite" zombies and they can be nasty! Some can capture you or pull you away from your group, while others will explode on you if you're to close to them when you kill them, causing the zombie horde to overwhelm you because you're blinded for a few seconds. I think it's so funny when your friend who's playing with you online is running along side right next to you, then BAM they are yanked up into the trees by one of the "elites" and you don't even notice it until they starts screaming on the mic for you to help. Beating the first scenario is fairly easy, but don't be upset that you just spent all that money on the game for an hour or two of entertainment... there are 3 other scenarios, harder diffficulties, and don't forget the multiplayer. If you're done with the single player, play online! Mulitplayer consists of co-op with up to 4 players, or verses mode with 8 players. Co-op allows you to run through the scenarios with your friends online. I recommend playing with friends you know! Sometimes it's frusterating if you're playing on a hard diffculty and some random person leaves the game in the middle of a level. Verses mode is just so much fun, this is my personal favorite! Players get a chance to run through selected scenarios as both the hunted and the hunters, where the hunted run through the scenario and hunters do everything in their power to stop them. Here's the catch, don't think you're getting stuck as a boring zombie. In the beginning of the match you're randomly selected as one of the elite zombies, then given a chance to decide where you want to spawn into the world. There are a couple more surprises that I won't name, I'll let you discover them on your own, but be weary because it's a scary game that will keep you on the edge of your seat! Left 4 Dead is a must have! It's something that will take you 40+ hours to beat, it is something you can jump into anytime for some multiplayer fun when your in the mood to blast things to bits.